I decided to write this article as I just received the most absurd feedback from a potential customer interested in the Multilingual Search Engine Optimization services offered by MSEO. Basically, I was speaking to a lady located in the New York area who was interested in promoting her website on foreign search engines in 5 languages (Japanese, French, Spanish, German and Russian). Although she obviously understood that her website would greatly benefit from such international presence, she was hesitant to move forward “due to the recession” according to her wording, which almost sounded like a mantra (she only repeated the word “recession” 8 times during a 15 minute conversation)! Surprisingly 58% of US citizens still share this ideology. Do you want to be stuck with the US market as your only potential source of revenue? 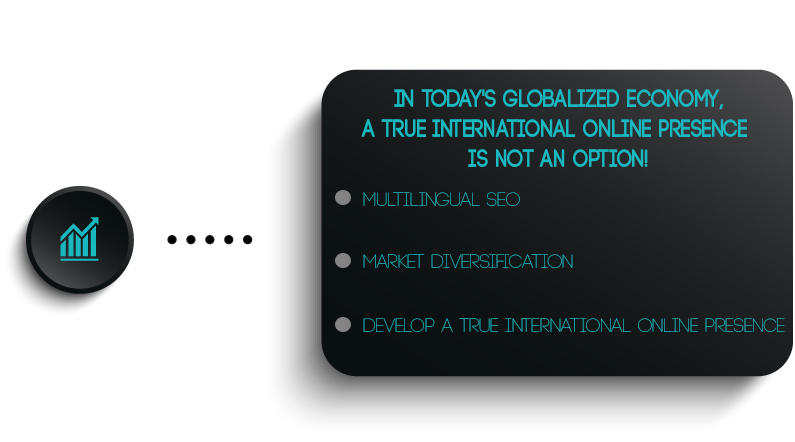 Developing a true international online presence by promoting a website on foreign search engines is the first step to market diversification… “Don’t put all your eggs in one basket” is a popular saying which I believe has its equivalent in all languages! Let’s take the aforementioned example of this US-based business which was considering implementing a multilingual search engine promotion campaign in 5 languages: Japanese would mean interacting with a clientele with a buying power based on the Japanese Yen; German equals Euros; French means Euros of course, but also Swiss Franc, CFA Francs (Africa), Canadian Dollars, Pacific Francs, Moroccan Dirhams, Tunisian & Algerian Dinars etc. ; Spanish “smells” like Euros, but includes multiple currencies from South & Central America, the Caribbean, as well as the US & Canadian Dollars considering the significant Hispanic online population in North America; Russian means Rubles and the Russian online market represents one of the most financially thriving online platform as a stand-alone language. Aside from diversifying your clientele by exposing your website to various economies, reaching globally allows you to develop a presence on geo-targeted markets which might rely heavily on imports regardless of the strength of their currencies. In fact, from Africa to Southeast Asia, there are many countries in financial dire straights which depend economically on imports of goods and services of all kinds! It is often in these micro economies that success stories are still being written! However, it is important to underline the fact that not all markets relying on imports are based on “funky currencies”! Think Arabic and then access Dubai or Abu Dhabi… Bahrain or Qatar just to name a few…. These are not only the wealthiest markets in the world, but, also, Arabic online gives access to the economical platforms relying the most on imports of all nature (goods /services / technology/ talents etc.). In spite of their motivation to develop a true international online presence through foreign search engine placement, I deal with many marketers who fear the language barrier resulting from multilingual platforms: “What do I do if I receive e-mails in Chinese? German? Japanese? Arabic? Etc.”. Apprehending such situation is really underestimating the English language fluency of international online communities. There are millions of individuals who speak English, but who cannot find your website since over 99% of them conduct their searches on foreign search engines using keywords in their mother tongue. It does not mean that because someone in Germany types your keywords in German on the German Google that such person does not speak English. The same applies for all languages. Again, 99% of all users type keywords in their mother tongue, and this is why it is crucial to have an online presence on major foreign search engines for a true global reach. Once again, increasing your online presence internationally is not about dealing with users in their mother tongue, since most international business is being transacted by individuals accepting English as THE International Language for global communication!